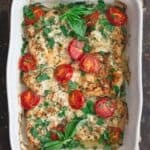 Easy Italian Baked Chicken, flavored with a simple spice mixture along with fresh garlic and olive oil, and finished with parsley and fresh basil. Be sure to read the tips for best results. Pat chicken dry. Place a chicken breast in a large zip-top bag and zip the top (make sure to release any air in the bag first), then place it on your poultry cutting board. Using a meat mallet like this one, pound to flatten the chicken. Remove from zip-top bag and reuse bag and mallet to repeat the process with the remaining chicken breast pieces. Season chicken with salt and pepper on both sides and place in a large mixing bowl or dish. Add spices, minced garlic, extra virgin olive oil, and lemon juice. Combine to make sure the chicken is evenly coated with the spices and garlic. In a large lightly oiled baking dish or pan, spread onion slices on the bottom. Arrange seasoned chicken on top, and add the tomatoes. Remove from heat. Let chicken breasts rest (cover with foil or another pan) for 5 to 10 minutes or so before serving. Uncover and garnish with fresh parsley and basil. Enjoy! Important Cook’s Tips: Do not skip pounding the chicken (step #2). Pounding the chicken into thinner, and more evenly flat pieces helps it cook faster and more evenly. And by pounding the chicken breast, you’re also mechanically tenderizing it, which means you’ll end up with a juicer and tastier chicken dinner. Cook’s Tip: Let chicken rest before serving to allow juices to redistribute. Visit The Mediterranean Dish store to check out our all-natural spices and olive oil selection.